A woman carries water up a steep hill in the Balukhali Rohingya refugee camp in Bangladesh. Aid workers say these slopes may collapse in the coming monsoon rains. Dil Bahar, a 32-year-old Rohingya refugee (in the red dress), and a relative carry water to their shelter in the Balukhali refugee camp. 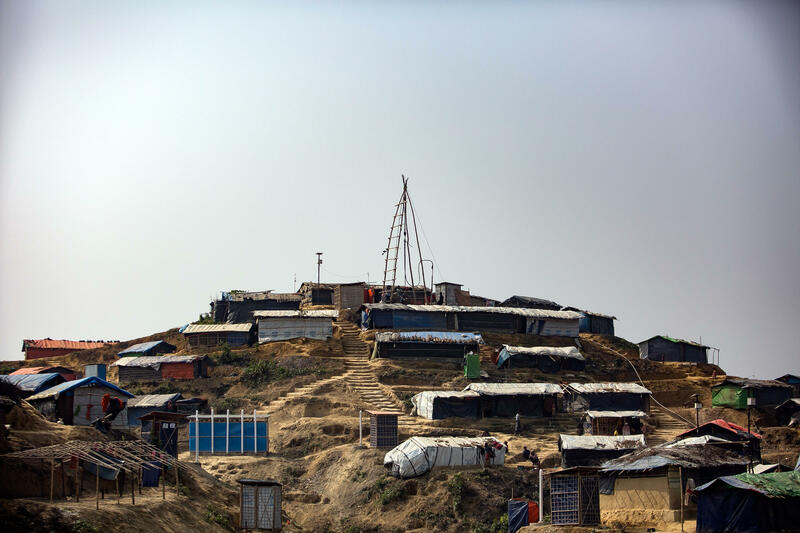 A view of the Balukhali refugee camp in Bangladesh. Aid workers worry that the hillsides could collapse during the heavy monsoon rains. 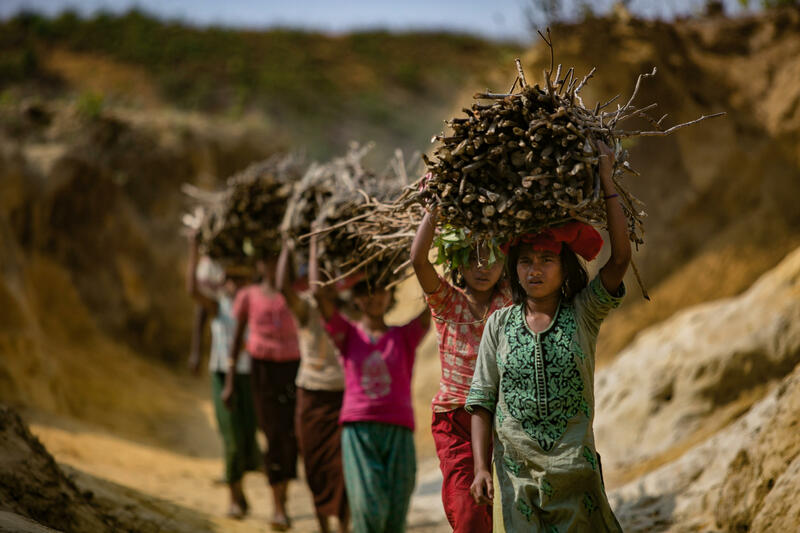 Children carrying firewood into the Kutupalong camp. Refugees have stripped almost all the area vegetation to use in cooking fires. Children dig up tree roots to use as firewood. Deforestation in the camps has increased the risks of flooding and landslides. People live in close quarters in the Balukhali refugee camp. The leader of this neighborhood says the biggest challenge is getting regular access to clean water. 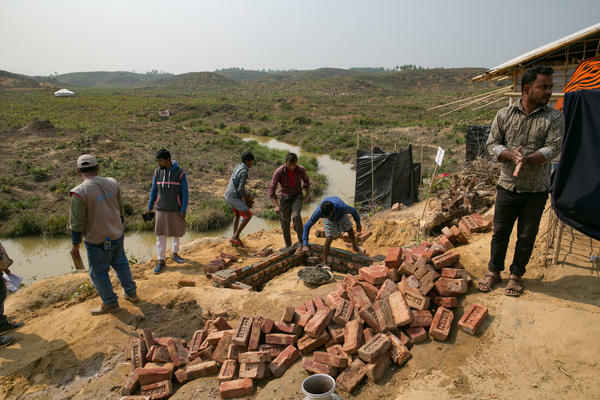 Men build a brick and cement toilet in the Kutupalong refugee camp. The new toilet will replace the open-pit toilets — covered with plastic for privacy — that can be seen in the background. Men carry a cement ring that will serve as part of a holding tank for a toilet being built in the Kutupalong camp. Many of the current toilets are just open pits that could leak sewage in the coming rainy season. Two men operate what's called a "donkey pump" as they drill a new water well in the Balukhali refugee camp. Aid groups are providing funds and materials to dig deeper wells that are less likely to get contaminated during seasonal flooding. The rigging to drill a new water well tops a hill in the Kutupalong camp. When the monsoon comes, bringing 20 to 30 inches of rain a month at their heaviest, aid officials worry that many of the hillsides where the Rohingya are living could collapse. There's also concern that hastily-constructed latrines could be flooded, contaminating the refugees' drinking water and sparking a major disease outbreak. In the Balukhali refugee camp, 32-year-old Dil Bahar scrambles up a steep footpath hauling a large aluminum vase of water. The sandy track rises sharply in front of her. Shelters made of bamboo and black plastic cling to the hillside. Even now in the dry season, the dusty soil slips out from beneath Bahar's feet. She says she has to climb this slope at least four times a day to get enough water for her family. Aid officials fear that in a few months, her daily trek could get much harder — if not impossible. "There's not just a risk of landslides but we're expecting significant landslides," says Emmett Kearney, who works on water, sanitation and hygiene issues for UNHCR, the United Nations High Commission for Refugees, at the camp. Not only is the soil sandy, but the refugees have stripped almost all the vegetation to burn for cooking fires and even ripped out tree roots to use as fuel. "You can see there are a lot of these slopes that are already at 40 or 45 degrees," Kearney says. Hiss office has calculated that hills with a slope of 45 degrees or more have an 80 percent chance of collapsing. Other reports have suggested that as much as a third of the refugee camp area could flood in a major deluge. The logical solution would be to move the refugees but that's easier said than done. The camps are already densely packed. In many places there's barely enough space to walk between the shelters, never mind add more in the areas of relatively stable ground. 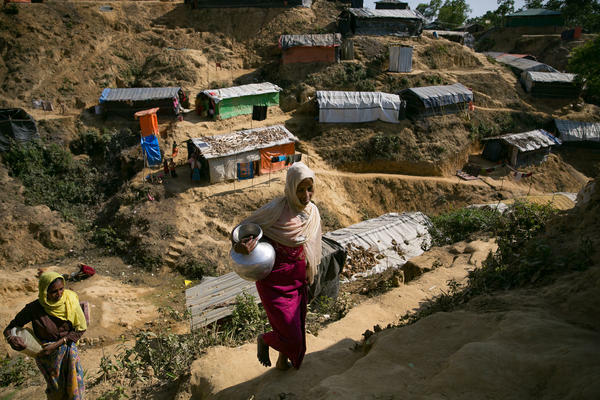 More than 800,000 Rohingya refugees are now living in a series of camps covering 3,000 acres. This includes many refugees who arrived years earlier. Three of the largest camps — Kutupalong, Balukhali and Thangkhali — bleed into one another and combined hold more than 600,000 people. Kutupalong alone, with 547,000, is twice the size of the second largest refugee camp in the world, the Bidi Bidi camp in Uganda. With the crush of refugees, the Rohingya camps grew spontaneously. Crude toilets and wells were dug with little or no planning. In the Kutupalong camp, young boys bathe in a shallow stream. The kids lather up with soap, then do flips into the water. Kearny says the concern is that heavy rains will flood nearby outhouses and wash raw sewage into bodies of water like this one. Not far from where the boys swim, Kearney points out a latrine that's starting to lean backward. "It's built on the edge of a hill. In the rainy season I expect it will be compromised," he says. "It could wash away quite easily." That's the other huge concern about the coming monsoons and these chaotic camps: In a deluge sewage will wash into the drinking water supplies of hundreds of thousands of refugees. There's the potential for a massive outbreak of cholera or another water-borne disease. There have already been large outbreaks of diphtheria and measles over the last few months. 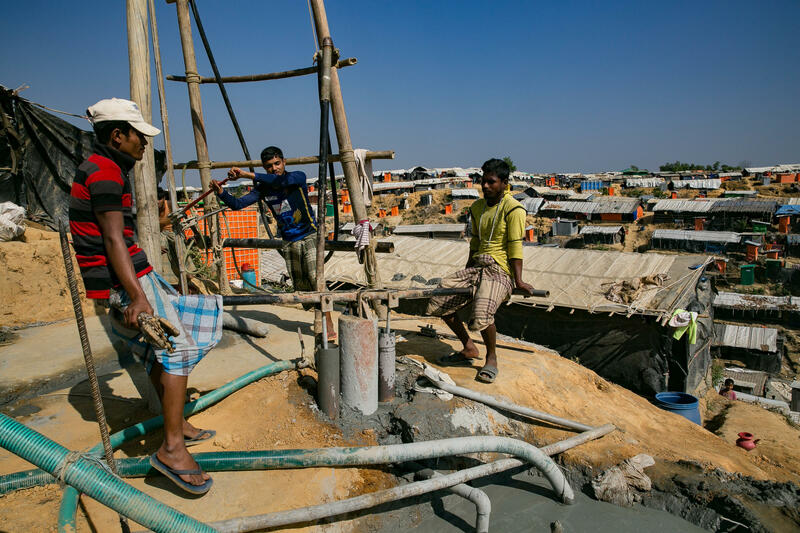 Workers from UNHCR and other aid groups are building hundreds of additional pit latrines with cement holding tanks and walls. Deeper wells are being dug to try to tap into cleaner water 500-to-600 feet below ground. Kearny at UNHCR says the challenge is to provide basic sanitation to a population the size of Denver before the camps turn into a muddy mess. "You're looking at developing all the water sewerage infrastructure from scratch in the mountains, in the hills, without road access, without many materials. [It's] tricky," he says. And it's not just aid groups working on toilets and drinking water that are worried. 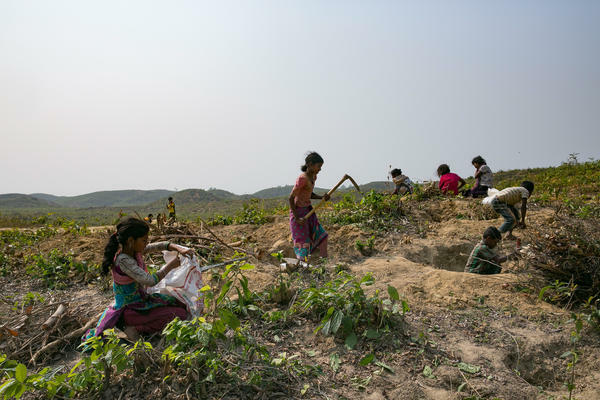 The refugees aren't officially allowed to work in Bangladesh so they're almost entirely dependent on food rations from the World Food Program. Distributing those rations in the muck could be logistically difficult. Officials from Doctors Without Borders, which runs several health facilities in and around the camps, are very worried about the coming rains. "It's already difficult to walk around. The biggest part of the camp is only accessible on foot," says Marcella Kraay, project coordinator for the aid group in Kutupalong. "When it's going to be slippery and muddy and with landslides, it's going to be near impossible." Kraay's teams are already dealing with dengue, which is mosquito-borne and could get worse if the camps are flooded. Hepatitis E and cholera could take hold. "With flooding going on waterborne diseases is something that we're expecting and trying to prepare for," she says. Severe outbreaks of diarrhea, she says, are a question of "not if but when." Any new outbreaks would come on top of all the medical issues that Doctors Without Borders is already trying to address. Their hospital in Kutupalong has a malnutrition ward with 13 beds, and there's a child in every one of them. The outpatient clinic overflows with children with colds, adults with cuts and broken bones. The pediatric ward is packed with kids suffering from diarrhea, pneumonia and other ailments. "We try to really keep the number of patients per bed to one but it's not always possible," she says, gazing into the ward where many of the beds have two kids in them. 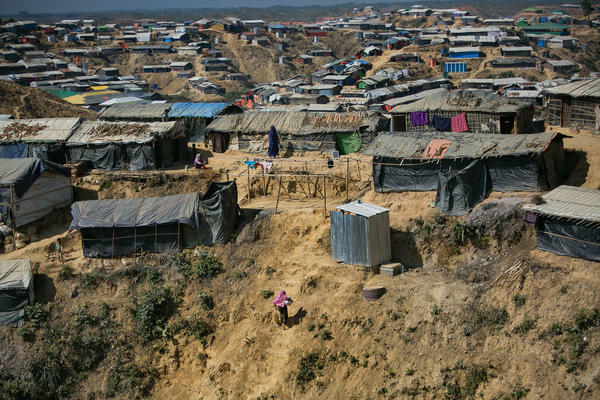 The diphtheria outbreak, which has sickened thousands in the camps and claimed nearly three dozen lives, highlights another risk factor for the Rohingya — a lack of vaccinations. Diphtheria outbreaks globally are quite rare because most people are vaccinated against it. Back in Myanmar, the long-persecuted Rohingya minority had little access to health care; many of them never got common childhood vaccinations. Kraay says from a health perspective all of this is a recipe for disaster. "Access to clean water in the camps is limited," she says. "If you're standing on one of the hills every direction you look at is just mountains beyond mountains of shelters with many people living in them. It's really clear that these are not conditions that are sustainable and definitely not healthy." And those are the conditions now — before the monsoon rains hit. The story of the Rohingya Muslims is complicated and gets more so every day. 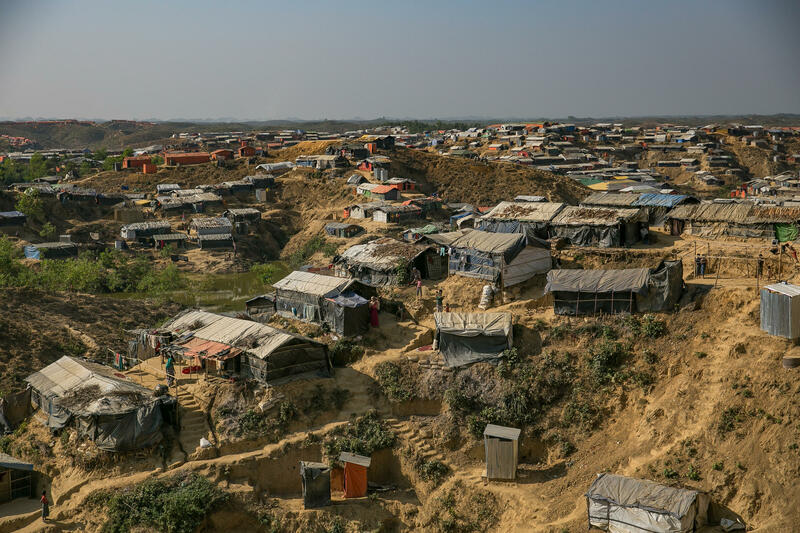 Evidence keeps emerging that Myanmar has used a campaign of terror to drive hundreds of thousands of Rohingya across the border into refugee camps in Bangladesh. They've escaped a murderous crackdown by Myanmar's military, and now, in the camps, they face other threats to their lives. NPR's Jason Beaubien visited a couple of the camps, and now he's back. Over the next few days, we're going to get a firsthand view from him of what's happening over there. Hi there, Jason. SHAPIRO: We've read and heard so much about this crisis. When you were actually there, what stood out to you the most? BEAUBIEN: What just strikes you is just how big these camps are. They just go on and on. It covers 3,000 acres. You know, I've covered a lot of different crises in the past. These are just huge. SHAPIRO: Right now, we're facing the largest refugee crisis since World War II mostly because of the Syrian civil war. And you're saying that these Rohingya camps are bigger than any of the refugee camps where Syrian refugees are being held. BEAUBIEN: If you look at the Syrian crisis, the Zaatari camp in Jordan is the largest camp there - massive camp. You know, just - you look at it, it just goes on and on - tents. It's 80,000 people. Here, we're talking about nearly 800,000 people. SHAPIRO: And unlike some of the other countries that house refugees, Bangladesh is extraordinarily poor. They have almost no resources. BEAUBIEN: Correct. And so this is a huge burden, and they're all concentrated in this one area. I'm, you know, hearing from a lot of the locals that they're getting frustrated with this. It's a huge problem for Bangladesh. How this is going to get worked out is a big problem. SHAPIRO: Well, we had heard reports that there was a deal between Bangladesh and Myanmar to return some of these Rohingya Muslims back to their home country of Myanmar. What did you learn about that? BEAUBIEN: So actually when I was there, this was supposed to start, and it was an incredibly ambitious plan to actually return all of them, to return 800,000 of them back to Myanmar. That got suspended while I was there because basically logistically they don't have the means to do it at the moment. But also you go to these camps - no one wants to go back to Myanmar. They are terrified to go back. They left because they're worried they're going to be killed. SHAPIRO: And many of their villages were burned to the ground. What would they even go back to? BEAUBIEN: Well, the Myanmar government has set up some camps, which actually look like - you know, they got razor wire around them. They look like concentration camps. 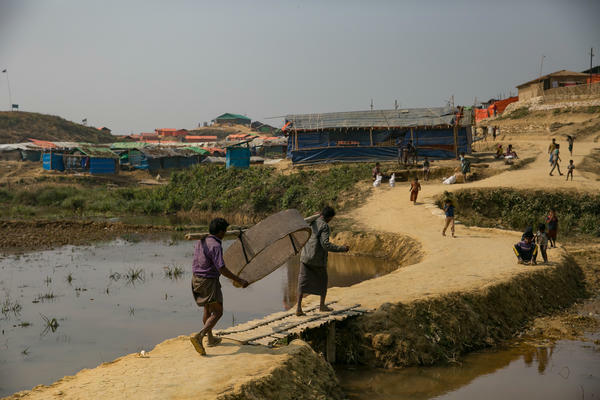 And people have seen the pictures of these camps that the Myanmar government has set up for them, and that is another disincentive to go back. They have no desire to go back at least at this point in time to Myanmar. And so it left them as this stateless people, which they were before. Myanmar doesn't recognize them as citizens. It's been a problem that's been going on for quite some time. They don't even have passports. And now they're stuck in these refugee camps in Bangladesh. SHAPIRO: Well, as we've said, you're going to bring us some stories over the next few days. 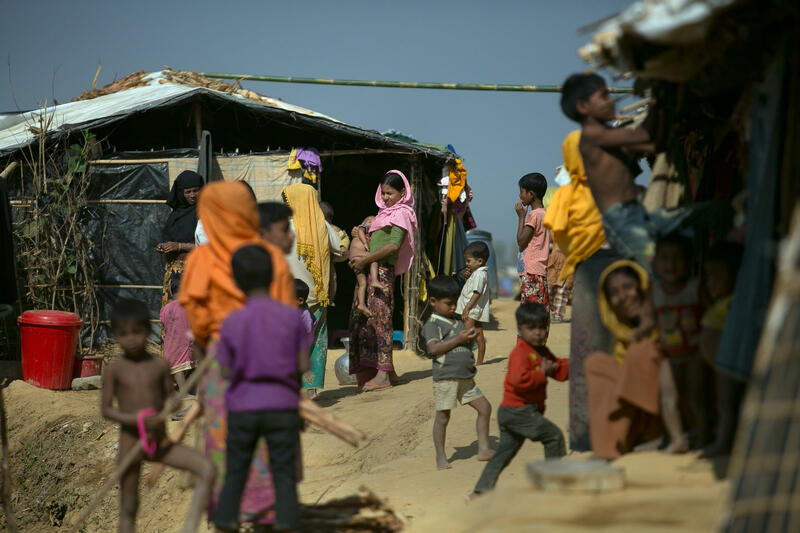 And today's looks at the conditions in those refugee camps in Bangladesh. BEAUBIEN: That's right. And this first piece starts - you know, I found this woman - this woman Dil Bahar. She's pumping water at the very bottom of this hill. And then she has to lug it up this incredibly steep hill up to where she actually lives. The ground is actually just sort of coming out from beneath her feet as she's kind of trying to get up there to the top. DIL BAHAR: (Foreign language spoken). BEAUBIEN: At the top, she says she climbs this slope four times a day to get enough water for her family. Aid officials fear that in the coming months the monsoon rains will inflict another catastrophe on these refugees. EMMETT KEARNEY: There's not just a risk of landslides, but we're expecting significant landslides. BEAUBIEN: Emmett Kearney works on water sanitation and hygiene issues for UNHCR - the United Nations High Commission for Refugees - at the camp. In addition to the soil being sandy, the refugees have stripped almost all the vegetation off the hills. KEARNEY: You've seen here that there are a lot of these slopes that are already 40 or 45 degrees. BEAUBIEN: Kearney's office has calculated that the hills with a slope of 45 degrees or more have an 80 percent chance of collapsing. The area is already so densely packed that there are few places to move these refugees to. These camps grew incredibly quickly. Crude toilets and wells were dug with little or no planning. BEAUBIEN: In the Kutupalong camp, young boys bathe in a shallow stream. The kids lather up with soap and then do flips into the water. The concern is that heavy rains will flood nearby outhouses and wash raw sewage into pools like this one. Not far from the bathing boys Kearney points out a latrine that's already starting to tip backwards. So this one right here. KEARNEY: Yeah. It's built on the edge of a - kind of a hill. So in the rainy season, I expect it will be compromised. It could wash away quite easily. And it's about 20, 30 feet from a hand pump. BEAUBIEN: Workers are in the process of upgrading hundreds of pit latrines with cement holding tanks and solid cement walls. Deeper wells are being dug to try to tap into cleaner water hundreds of feet below ground. The monsoon rains tend to start in April and at their peak dump 20 to 30 inches of rain a month on this area. Kearney at UNHCR says the challenge is to provide basic sanitation to a population the size of Denver or Boston before the camps turn into a muddy mess. KEARNEY: When you're looking at developing all the water sewage infrastructure from scratch in the mountains, in the hills, without road access, without many materials - tricky. BEAUBIEN: And it's not just aid groups working on toilets and drinking water that are worried about the coming rains. Officials with Doctors Without Borders, which run several health facilities in and around the camps, say they're very concerned about the monsoons. MARCELLA KRAAY: It's already difficult to walk around. I mean, the biggest part of the camp is only accessible on foot. BEAUBIEN: Marcella Kraay is the project coordinator for Doctors Without Borders in Kutupalong. KRAAY: When it's going to be slippery and muddy and with landslides and stuff, it's going to be near impossible. BEAUBIEN: The refugees aren't officially allowed to work in Bangladesh, so they depend primarily on international food aid to survive. But distributing those rations in the muck could become logistically difficult. And Kraay says additional disease outbreaks are nearly inevitable. KRAAY: With flooding going on, waterborne diseases, you know, is something that we're expecting and trying to prepare for next. Acute watery diarrhea is, you know - like I almost want to say it's not if but when. BEAUBIEN: Any new outbreaks would come on top of all the other medical issues that Doctors Without Borders is already trying to address at this bustling hospital. Their facility in Kutupalong has an entire ward filled with malnourished children. Their outpatient clinic treats colds and cuts and broken bones. The pediatric ward is packed to capacity. KRAAY: You see that we try to really keep our - the number of patients per bed to one, but it's not always possible even. BEAUBIEN: A diphtheria outbreak, which has sickened thousands in the camps and claimed nearly three dozen lives, highlights another risk facing the Rohingya - a lack of vaccinations. In Myanmar, the long-persecuted Rohingya minority had very little access to health care, and many never got common childhood vaccinations. Kraay says the conditions in the camp are a recipe for disaster. KRAAY: If you're standing on one of the hills, every direction you look at, it just is these mountains beyond mountains of shelters with many people living in them. These are not conditions that are, you know, sustainable and definitely not healthy. BEAUBIEN: And the problem here, Ari, is that these conditions are now in the dry season. The monsoon rains are coming. There's great concern that this densely populated camp - in particular if there's a disease outbreak or a landslide, it's going to be very hard to get to those people and help them out. SHAPIRO: Wow. Well, give us a preview of your story tomorrow. What are we going to be hearing about? BEAUBIEN: So tomorrow, we're going to focus on one woman. She just found out she's pregnant and sort of talks a bit about why she left, what she misses about Myanmar but why she also says there's no way she's going to go back.